Savannah, Georgia is where I am currently hanging out. I have this room at the local Hyatt, an allegedly four star hotel, that looks down on the Savannah River. The view from my room is satisfying. Tugboats periodically push freighters up and down the river. This gives me close encounters with ships that I rarely get. A yacht that looks fancy enough for Donald Trump is parked beneath my window. Also tethered nearby is a riverboat with a big paddlewheel that takes tourists out onto the river. Just up the river is the Talmadge Memorial Bridge, an impressive a cable-style bridge. Completed in 1991, it has given this otherwise sleepy Southern city an impressive and stylish new landmark. It will soon be hard to imagine Savannah without the bridge, in the same way it is hard to imagine New York without the Statue of Liberty. This is not New York though; this is the South. I know I am back in the Deep South when I hear that distinguished muddy Georgian southern accent and have a hard time finding a restaurant without grits on the menu. Nevertheless, that is okay. The problem with most of the South these days is that it has lost its character. Atlanta is a case in point; it has gone crazy and completely morphed from its roots because it got addicted to growth. Savannah seems content to remain an old-fashioned Southern City. It has become gentrified, but in a good way. It is like New Orleans, but without most of its crime as well as its inebriated and often licentious patrons. Rather than having a French Quarter, it should have an Irish Quarter. Reputedly, it has the second largest St. Patrick’s Day parade outside of New York City. It is not hard to hear Irish brogues walking around this city. Yet there are other accents too. Whereas not too long ago the city was almost exclusively white and black, now it is increasingly multicultural. Russian was just one of the languages I heard this evening strolling along River Street, an aptly named road mostly for pedestrians that is right next to the Savannah River’s south side. Also largely absent, at least from downtown Savannah, are many of the common markers of globalization. There is a Starbucks but it is several blocks away from my hotel. There are no Wendy’s or McDonalds within walking distance of downtown, at least that I have discovered. There are lots of independently owned restaurants, as well as restored vaguely Victorian-like buildings. It is a sleepy southern city that understands its current success is due to careful marketing and restoration. Minus much of New Orleans’ crime and poverty, it is much more approachable. You can find championship golf, horse drawn wagon rides and tours of Savannah’s many haunted areas. Savannah has a rich history of murder and scandal that presumably is now mostly in its past. The modern Savannah now sees these dark days as a marketing opportunity. You can take tours of its haunted areas conveyed in hearses. 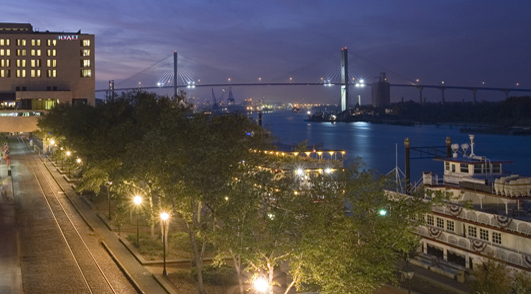 For a haunted city, Savannah nonetheless has its charms and unique features. I like the little parks scattered every few blocks here in the downtown area. They are lined with tall and shady trees, and often come with a fountain. I imagine that in its pre-air conditioned days these parks were lovely oases for tired and hot souls. They still are. Although I am sure children are discouraged from playing in the fountains, I suspect in the height of summer that the temptation become too much to resist. There is traffic in Savannah, but it is manageable. The streets are clean and well maintained. At least this is true until you move toward the outskirts of the city. Then it becomes a city rife with strip malls, fast food outlets and billboards. I was charmed by Savannah’s airport, simply because it is small compared to the airport I regularly fly in and out of: Washington Dulles International Airport. There were no underground trams or movable walkways because the terminal is not big enough to need one. There is no need to worry about airport congestion because the airport does not have enough traffic to become congested. Despite the short walk to baggage claim and being in Seat 1A in the little regional jet I flew in on, my baggage had arrived at baggage claim about the time I had walked there. I am here to press the flesh and to give a presentation tomorrow. An organization called the National Hydrologic Warning Council is convening here. While NOAA and the USGS are the two heavyweight federal agencies affiliated with the NHWC, there are other smaller and regional organizations affiliated with it too. Despite its name, this group does important work. One only needs to witness the mess that was Hurricane Katrina to understand why the NHWC is needed. It is in the business of sharing information on how to predict and warn affected people and organizations of major storm events like floods and hurricanes. My agency, the USGS is in the business of constantly monitoring the nation’s streams, lakes and ground water. The data we collect on the near real time stream flow conditions is in high demand by these people. Its ready availability and accessibility is crucial to their forecasting needs. What I have learned so far is that it is easier to predict the effects of these events than to figure out ways to get the information to the right people so that lives and property are saved. The predictions for Hurricane Katrina were right on the money. So why did government on all levels do such a bad job of managing its effects on people? This is some of the dialog occurring at this conference. In part, I am here to point a way toward the future, by showing how my agency is working to make its stream flow data more accessible to other monitoring systems using a technology called web services. Savannah has seen its share of devastating hurricanes, so it is an appropriate place to hold a conference like this. It also makes an interesting place to visit, if only for a few days. My family moved to Daytona Beach when I was fifteen. The Deep South was quite a shock for someone raised in upstate New York. It never agreed with me. Five and a half years were enough. After college graduation, I moved to the Washington D.C. area. I have been reasonably happy there ever since. Still, I found this reacquaintance with the Deep South a pleasant experience. Time moves a bit slower here in Savannah. It is not suffering from the effects of crazy growth as we have in Virginia. Savannah has figured out a way to live in the 21st century while being true to its Southern roots. Perhaps there is some wisdom here in the old South that my youthful prejudices could not see. I hope life takes me to Savannah again. Next time I hope I will be here strictly for pleasure.